I’m announcing a new category of blog posts on this website. Snippets will contain bite-size information on topics related to the New World-Old World contacts and connections. As I’m traveling back from Santa Fe, I have a little bit of time to pull together two interesting news bits both related to the role of Mongolia as either a jumping point to the New World or a recipient of gene flow out of the New World. Documenta Praehistorica 31 (2004): 139-149. The Bones and Behaviours group at Zetaboards has shared with me this paper which contains information (pp. 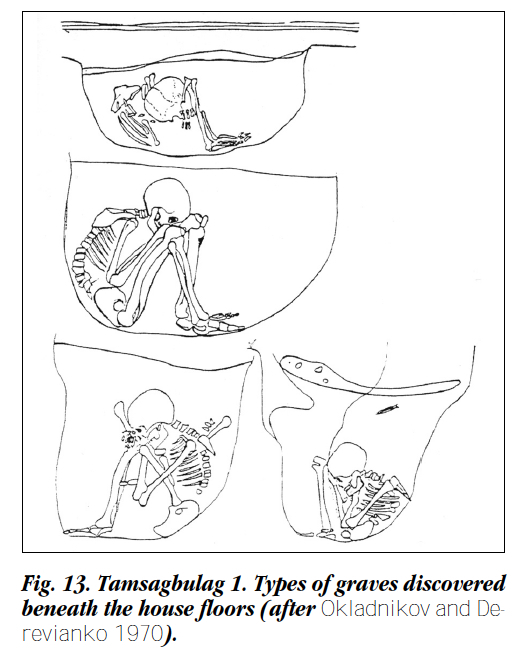 144-145) on an intriguing similarity between the sitting burials found by foremost Russian archaeologist Alexei Okladnikov (1908-1981) under the floors of dwelling at the Mesolithic/Neolithic Tamsagbulag site in easternmost corner of Mongolia and pre-historic Andean burials. The Russian original appeared in a publication (Окладников, А.П., Деревянко А.П. Тамсаг-булаг. Неолитическая культура Восточной Монголии // Материалы по истории и филологии Центральной Азии. 1970. Т. 5. С. 13-20) that I don’t have access here in the U.S. I’ll double check with this original once I put my hands on it. It reminded me of the connection between Catalhoyuk under-floor burials and Andean burials that I once fancied after having attended Ian Hodder’s lectures and classes at Stanford University. 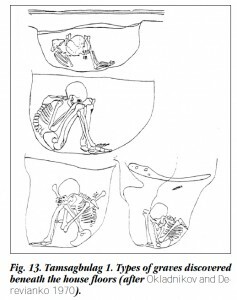 But the Tamsagbulag burials provide a more direct match. Archaeology, Ethnography and Anthropology of Eurasia 3 (2013), 14-21. Tabarev A.V., Chris Gillam, Y. Konomata, B. Gunchinsuren. Chris Gillam has kindly pointed me to this piece of research and even sent me the Russian paper that reports on the discovery of a Paleolithic flake cache in north-central Mongolia. Tolbor stands out as a flake-only culture. No blades or microblades have so far been found at Tolbor. Typological considerations, therefore, assign it to the broad period of 25,000-15,000 YBP but no AMS dates have so far been obtained. Blade caches are rare in Eurasia (e.g., Grand Pressigny in France) and flake caches are completely non-existent. There are no traces of debitage anywhere near the Tolbor site, no nuclei or any other lithic elements that may indicate a workshop. The only other alternative is that Tolbor is a deliberately assembled cache. While caches are rare-to-non-existent in Eurasia, they are frequently found as part of the Clovis Complex in North America. The Paleoindian caches are found in strategic points of the landscape (cliffs, rockshelter, etc.). The same seems to be the case at Tolbor as one can directly observe all of the midstream of the Ikh-Tulberijn-Gol River from the cache site. But, as Tabarev et al. (2013) point out, Tolbor flakes lack the typical Clovis ochre pigmentation that is usually interpreted as a sign of the ritual role played by those caches in North America. The team is preparing an English version of the paper. Preliminary results were reported in Gladyshev S., A. Popov, A. Tabarev, J.W. Olsen, B. Gunchinsuren. 2011. 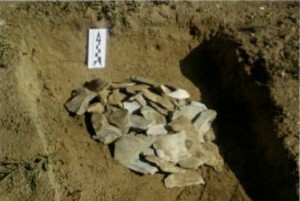 First Known Paleolithic Cache in Mongolia. Current Research in the Pleistocene 28, 58-60. It would be nice to know for sure their racial type, though I’m sure they must be like the Chandman people. There is actually more than one of us in the B&B project. the idea is to create a space for discussion of various ‘edgy’ subjects from racial differences to hominology. Our aim is to establish eventually an open access journal of our own with qualified reviewers on board. Each e-printed piece online will then link to the forum for discussions between academics and laypeople. Got it. I deleted it.